Football fever is spreading all over the world this week. 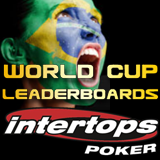 Intertops Poker has caught the bug and is hosting a month-long World Cup Leaderboard tournament series. Special poker tournaments beginning 90 minutes before each World Cup group game will award tickets to a $10,000 GTD at the end of the festivities in Brazil. But let's not get ahead of ourselves -- Intertops’ World Cup celebrations begin with a $1000 Freeroll tomorrow, June 10 at 20:00 GMT (3:00 pm Eastern). Full contest details are available under the Promotions tab on the Intertops Poker website.